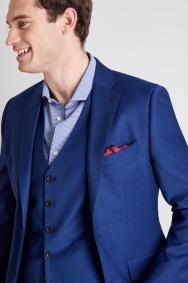 Part of our Moss 1851 Performance range, this tailored fit suit is made from a blend of wool and Lycra to create the ultimate in comfort without scrimping on style. 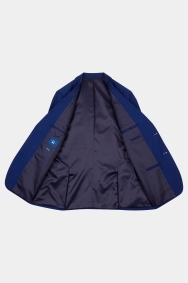 It's water repellent, stain resistant, and has a breathable lining to minimise sweat no matter how active you get. And with high crease recovery, you'll always look effortlessly sleek with this single-breasted number. Complement the bright blue colour with sky blue accessories. Excellent fit and quality material, looks superb. 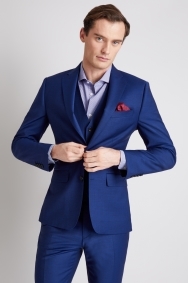 Nice colour, fabric thinner than expected but ok for spring wedding. The suit quality is very good. The colour and size was perfect. Very happy with the quality. Nice fit and easy to move in and comfortable to wear. My brother love's it and it fit perfectly. 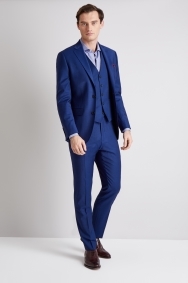 Lovely suit and just what I needed for important interviews coming up this month. Great looking suit. Fantastic price. 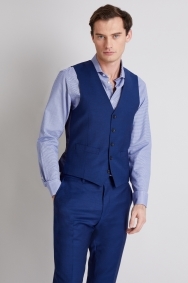 Would be even better if the waist coat was a bit cheaper. Good quality, super fit straight off the rail with no alterations. Material gets dirty quite quickly must dry clean after two wears other than that I am very happy! 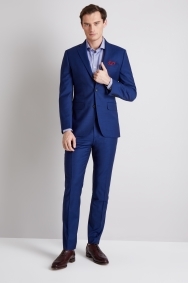 Good suit- I really like the fit and good value! Now with the whole outfit I feel like the best dressed chicken in town. Son was happy, me less so being told how many characters I have to use in a survey! It is my sons first suit and he loves it. 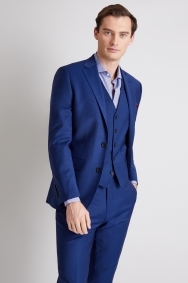 This suit cost me less that 50% of what I would normally pay in Hugo Boss and probably a tiny bit more than I would pay in Marks and Spencer BUT The quality is certainly as good if not better than both of the above. 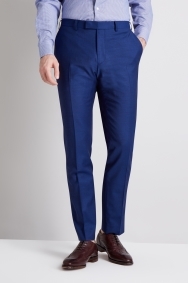 Moss Bros is the best so far and i have tried most brands so far in respect of brands available. a waist coat was not available which is a pity as the suit is fantastic. comfortable and smart. Not a heavy jacket either so ideal if wearing for a long time. 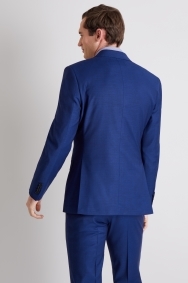 Perfect fit, comes in very nicely at the waist, the sleeve and jacket length is spot on, my shoulders come up perfectly to the jacket shoulders and the back sits nice and flat.